A chuck to an electric drill or similar that can be operated by by hand, rather than by using a chuck key. A great time saver,These are three jawed chucks. For fairly obvious reasons these chucks are only found on small drills etc. that are also fitted with a reverse switch. 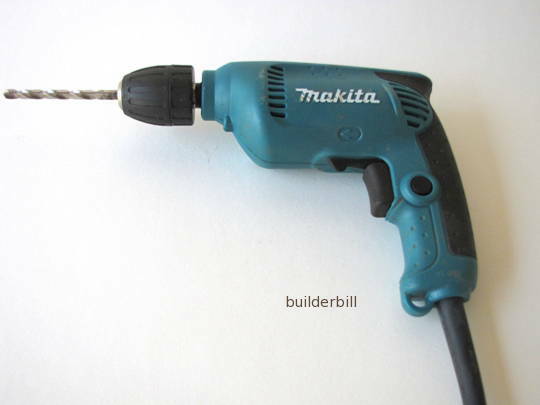 The photo here are of a Makita 10mm drill. Keyless chucks are just about the norm on battery powered drill. To tighten the chuck the drill bit is held in place correctly by turning the sleeve by hand, then it is firmly gripped around the knurls by one hand and a quick press on an off of the start trigger adds the final tightness. Undoing is just the same, after the drill has been placed in reverse.